In the Enchanted Kingdom: A Strangers Venom, you’re a respected and honored healer who has been invited to the theatre, and once there, find there’s shenanigans going on. What should be a relaxing, rewarding time is one fraught with danger and intrigue. Enchanted Kingdom: A Strangers Venom begins with mystery as you arrive on your trusty griffin. The surroundings (where you parked your griffin), feel like something out of the Middle Ages and you almost expect a medieval minstrel to come around the corner playing the lute and singing about love. Well, that may not be a thing, but when you see emerald crystals growing on victim’s eyes, knees, shoulders, and more, you think, “Ick. Crystal disease.” Your job as a healer is to find all the ingredients to create healing potions. You are also busy chasing angry Amber, whose fiery temper keeps you constantly at bay. Upon your entrance to the theatre, a mannequin/dummy guard stops you and asks for your credentials. This is the first glimpse of the beautiful graphics in this game. His eyes glow, his wooden mouth moves like a ventriloquist doll, and he’s dressed in a dark, flowing cape. The graphics are detailed and colorful, almost artistic, which really makes you want to explore all areas to see what’s around the next corner. The ambiance is beautiful and the colors are rich and bright. Purples blend into blues, and deep jewel tones surround you. Dimly lit areas add a soft glow to each room, which creates a soothing atmosphere. This is a setting I would definitely love to be in, minus the bitter and angry sorceress. 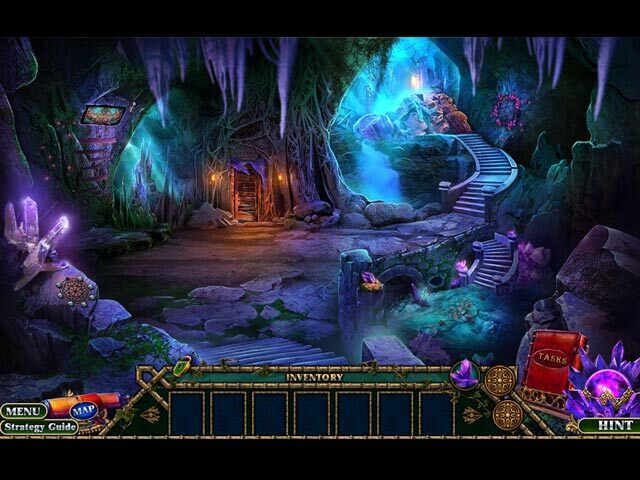 The background music adds to this fantasy setting, and you can control the volume in the beginning to what works for you. The characters in this game often talk to you, and when they do, dramatic music plays, which I felt was a little over the top and distracting. Enchanted Kingdom: A Strangers Venom includes a book of tasks, which keeps you up to speed on what you should do next. You also have to find flowers, crystals, and statues as you move around each room focused on your task, which keeps you looking in every nook and cranny. I liked the small touches added, clicking on some of the items around the room made them interactive. I discovered this when I accidentally clicked on a chandelier and all the candles burst into flame. 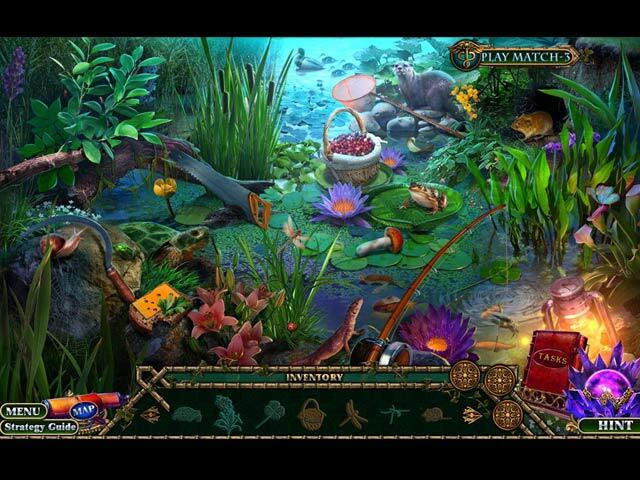 There are plenty of hidden objects to find – and in some, you have to put things together before you can collect them. Once you find one, like magic, it shimmers and fades. Sometimes, items you find you use indirectly (like using the item you found to dig up another item you need). I did find the game seemed to lag a bit. I wasn’t progressing as quickly as I wanted to and found myself back in different rooms several times. This is great if you like to play, save, and come back to it. When I wanted to skip a game, I found I had to wait a while for the skip/hint button to fill up, which is very slow. 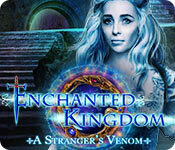 All in all, Enchanted Kingdom: A Strangers Venom is a definite feast for the eyes. If you like fantasy style games and don’t mind taking your time, then check this one out!